Although I'm sometimes known as the proud pork mom and love me some pigs and pork, my 4-H livestock career began with 2 lambs and actually a few rabbits. Although my mom had grown up on a hog farm and both of my parents showed pigs in 4-H, when I started 4-H at age 10,we didn't really have a place to keep pigs, but we thought we could make it work with a few lambs, Chip and Dale. (Real creative I know.) Eventually, it would work out that I would be able to show pigs in 4-H, but it all started with sheep. Now that being said, I will admit I have never been a fan of lamb so I was a bit nervous when it was announced that the secret ingredient of Ott, A's February Iron Chef Challenge would be lamb. But I was up to the challenge especially since it was lamb chops and I had never tried lamb chops. So now I was on a mission much like I was with the duck challenge of January to find an easy to prepare, kid-friendly recipe. Thanks to allrecipes.com I think I succeeded and with my good friend, Leah at Beyer Beware, as inspiration and the hints on the website, I even made a few tweaks to the recipe. Now I started with 4 lamb chops, so I cut the recipe back by 2/3 and only used one egg, a 1/2 teaspoon of each of the sauces, and about a cup of breadcrumbs. So before I did anything, I preheated the oven to 375 degrees. Then in a medium bowl, combine the egg and Worcestershire sauce and Soy sauce; stir well. Dip each lamb chop in the egg/sauce mixture. Then arrange chops in a 9x13 baking dish and top with freshly cracked black pepper. Pretty easy if you ask me. Now last night was a weird night at this pig pen as Big Sissy was asleep by 5:30pm as she came home from school complaining of a sore throat. (When she woke up at 8:15pm, we headed to urgent care where she was diagnosed with strep throat. Not fun, but I'm glad we went last night as she just woke up this morning and is already like a new kid.) Bubby fell asleep on the couch before dinner was ready as he has had 2 busy days of hanging out with Cousin N and Cousin E. So it was just Little Sissy, The Farmer, and me to try the lamb chops. We really didn't know what to do in such a quiet house. Any way, the lamb chops were a hit; although, The Farmer did ask if I could try the recipe with pork chops next time. So it wasn't a complete conversion with The Farmer, but thanks again to Ott,A for making us live outside our comfort zone once again. And be sure to check back in 2 weeks from today, as Ott,A, will be doing a guest blog right here for Farmer Fridays. 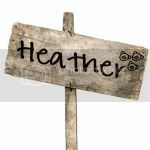 In the mean time, if you want to learn more about sheep or lamb, be sure to check out her blog as it is full of information. Believe it or not, I'm still alive despite the fact I haven't blogged in almost 2 weeks and have taken to vicariously living through my friends since my full-time, off-farm job has kept me busier than normal the last few weeks. Thankfully, I did get to spend some time with Martini last week so that is a major plus if I have to be away from home. So while I've been busy and out of town with work a lot, some of my fellow Real Farmwives of America & Friends have been quite busy. Cris, Leah, Megan, Liz, and Marybeth went on the field trip of a lifetime to meet the one and only, The Pioneer Woman. I had never blogged a day in my life and had read very few of them before my good friend, Leah, introduced me to The Pioneer Woman and ever since then I was hooked and soon starting blogging myself. So although I didn't get to meet her, I'm glad that they did and hopefully next time my busy work schedule won't keep me away from a fun field trip with my fellow Farmwives. Although I hate to jinx myself I do think I might be able to the light at the end of the tunnel in regards to the busier than normal work schedule, but I know I've said that before so we'll just take it one day at a time. But don't ask me about my kitchen table ... it's seen better days. Today is a special Farmer Fridays as it is a guest post from one of my fellow Real Farmwives of America & Friends, Marybeth from Alarm Clock Wars. Marybeth is a pretty amazing woman as she is not only a farmwife, but she is a veterinarian and always has a great adventure to share. 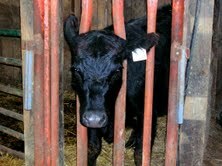 Today's guest post does not disappoint, but it does have some graphic photos of a C-section on one of her cows so be prepared. About two weeks ago, we needed to help. One of our first calf heifers was going into labor. Hubby Doc found her in first stage labor around 7:30am. He had to go to work, so he asked me to keep an eye on her for the next few hours and let him know what was going on. Cattle can be in first stage labor (before the mother starts pushing and the baby starts coming out) for up to 12 hours, so we weren’t too worried at this stage of the game. The bag hanging down is part of the placenta. This is filled with fluid, and starts to detach in the first stage of labor. In cows, this can last a long time, but this is not in many other species. If you have a pregnant animal, call your veterinarian so you know what to expect when it’s time for the baby to be born! I kept an eye on our new momma through the morning, and she wasn’t making any progress. Hubby Doc always comes home for lunch, and it just happens that he had this afternoon off. So when he got home from work, we got this lady into the barn for an exam. From here, we did a vaginal exam to see if the calf was still alive, and if he was coming in the right position. Hubby Doc could feel both front legs pointed in the right direction, but the baby was turned to the side. When he gave a tug on a foot, the calf kicked back! Hubby Doc got chains wrapped around both front legs to try to pull the baby out. The chains get wrapped around the lower part of the leg, above the hoof. There is a special way to wrap the chains so you don’t pull too hard on the leg and hurt the calf. As we pulled on the legs, we realized the calf was twisted farther than we thought. The yellow part of the hoof should be facing down towards the ground, not up towards the cow’s tail. The calf’s head was also arched back, and we couldn’t get the head looking the right way. We could also tell (by the size of the feet and the feel of the head) that this was going to be a big calf, from a small heifer. We decided the best thing to do, for both the momma and the baby, was a Cesarean section. Many farmers will try to pull calves themselves. They have learned from their veterinarian how to put on chains, and what to feel for. However, when they get to this point, they will call a veterinarian to do the surgery. So far, we have not given this heifer any medications. 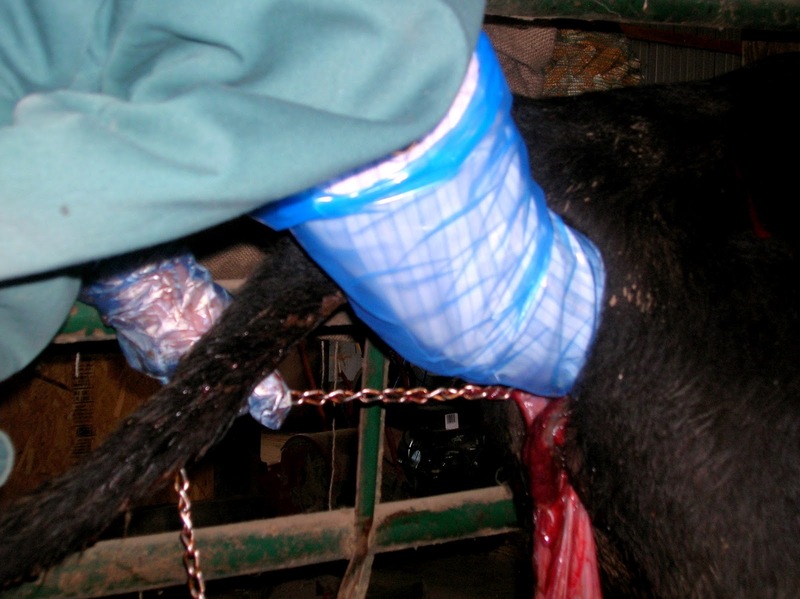 Sometimes, epidural anesthesia can be helpful to get a cow through a painful labor. This heifer had not been in second stage labor very long (actively trying to get the calf out), and she was not in excessive pain. Also, we wanted her to try and push to help us get the calf out. With an epidural, they will not push. We did not sedate our heifer for this surgery. If you sedate cattle, they will try to lay down. Since we were getting ready to open her abdominal cavity, we did not want her to lay down on the dirt floor of the barn. This would have gotten dirt inside her abdomen, which would have made her very sick. 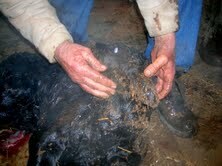 With good local anesthesia, and a quiet environment, cattle will stand still during a surgery like this. After we gave the local anesthesia a few minutes to take effect, Hubby Doc started surgery. Here, he is pulling the uterus towards the body wall so he can have easier access to the calf inside. He made an incision in the uterus, and we pulled the calf out! We laid him down on the barn floor, so he got pretty dirty right away. He had some bleeding from his umbilicus (common with C-sections), and I put a clamp on it for a little while to stop the bleeding. By the time the surgery was finished, momma had licked her new baby pretty dry, and he was trying to stand up already! New kiddo is an 87-pound bull (male) calf. As far as beef calves go, he’s actually about average size. But his momma was on the small side, and he was not trying to be born in the right position. Between him being a little big, and her being a little small, and the malpositioning, a C-section was the right decision for this pair. 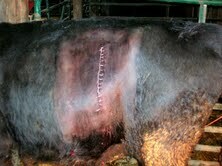 Momma cow has a pretty line of sutures in her side. These will get taken out about 14 days after surgery. We also gave momma some pain medications and antibiotics after surgery. She will stay on these medications for 5-7 days. Baby got some new jewelry. All the cows on our farm get ear tags. This is how we identify each individual animal. Hubby Doc can tell the cows apart from across the field, but for the most part I think one cow looks like most other cows. Getting ear tags is just like getting your ears pierced. Quick and it’s done! This baby’s number is 1F03. 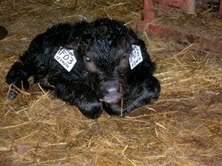 That means he was the third baby born on the Feutz farm in 2011. 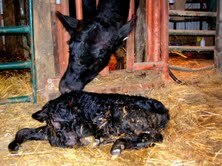 His momma is 9F09 (ninth baby born on the Feutz barn in 2009). We also put the baby’s birthday and his momma’s number on the tags. We nicknamed him Charlie. One week after his birth, and momma and Charlie are doing well! We kept them separate from the rest of the cows so we could give momma her medications easier and so we could keep an eye on the new baby. This weekend, they will get turned out with the rest of their friends! Want to hear more about cows, what it’s like to be a veterinarian, or have some questions? Come see me at http://alarmclockwars.blogspot.com sometime. I blog about our farm, our cows, being a veterinarian, my daily battles with my alarm clock, and living in southern Indiana. I’d love to have you for a visit! When The Farmer and I got married over 10 years ago, my co-workers at the time gave us a recipe box full of recipes from each of their families. It was a great gift and the recipes are even better. One of The Farmer's favorites has always been sausage and pepperoni pizza casserole. It is pretty easy to make, but I will admit, I haven't made it in a long time. So it was a blessing in disguise that I had been planning to make it prior to the Ice Storm of 2011 and had all of the ingredients on hand when we were iced in at home. I thought it would be the perfect meal to reward him for working so hard to prepare our family farm for the predicted weather. Unfortunately the thought of taking pictures while I was making this didn't really enter my mind until we had already started eating so you will just have to use your imagination. Brown and drain sausage. In large lightly greased casserole dish, layer half of the noodles, sausage, pepperoni, sauce, and cheese. Repeat with second layer of noodles, sausage, pepperoni, sauce, and cheese, reserving several pepperoni slices to garnish the top. Bake at 350 degrees for 35-40 minutes. It's hard to believe that it is Friday especially considering Big Sissy and Bubby haven't been to school since Monday. Monday night the freezing rain appeared and we woke up to about a half inch of ice on Tuesday morning and no school Day #1. Although Big Sissy didn't have school due to the weather on Tuesday, there is no such thing as a snow day or weather delay or cancellation of any kind on our family farm or truthfully any farm that has livestock to care for on their farm. The care of our animals always, always comes first especially in times of inclement weather. The Farmer and my father-in-law spent all day Monday getting ready for the predicted weather. Due to the freezing rain being predicted, we were quite nervous that we might lose power and for an extended period of time. Since our pigs live in climate controlled buildings which is such a blessing in weather like we've had this week, keeping the electricity going is a must. The Farmer and his dad made sure the generator was ready to go if needed. 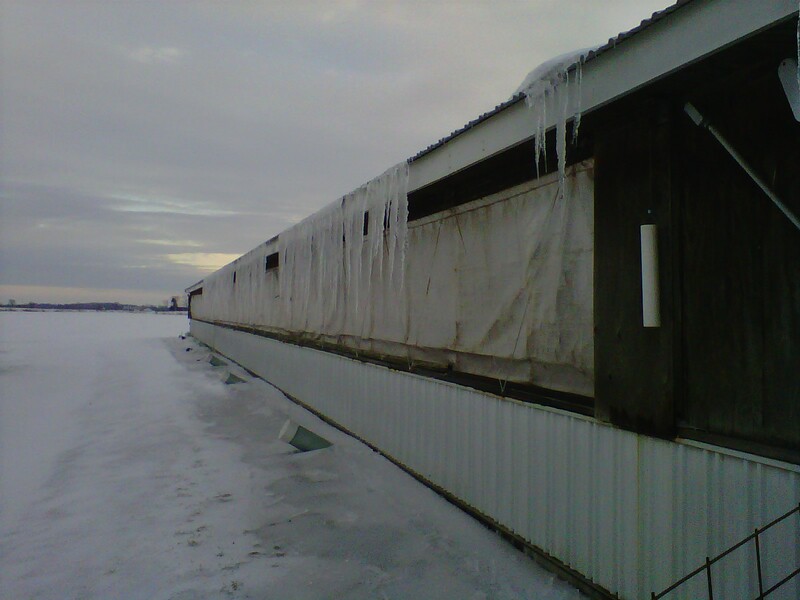 Additionally, they spent extra time making sure all of our feed bins (bins where we store pigs feed on the farm before it is delivered to their feeders) were full in case we couldn't get feed to them due to the weather. On Tuesday, they continued to ready our farm for Round 2 which was predicted to hit around late afternoon. Thankfully be the grace of God, the precipitation that fell was sleet followed by snow and not more freezing rain. Although this did nothing to help road conditions, this may have spared us from a major power outage for our home and farm. The farm did lose power around 8pm on Tuesday night; however, it returned around 1am. Thanks to our generator, the pigs never even lost a bit of sleep over it and since the power returned relatively quickly The Farmer and his dad were able to get some sleep too. As I said earlier, the road conditions were quite less than desirable so Wednesday, followed by Thursday, and then Friday all arrived with school being cancelled for Big Sissy and Bubby. Thankfully I wasn't scheduled to travel far from home this week and was able to cancel the appointments I did have so I was able to work from home with the kids during this mini vacation from reality for them. (I did reaffirm that the master bathroom with a locked door is a great place for a conference call when the kids are at home with you.) In fact, I didn't even leave the house for 48 hours straight which may have been a first without someone being sick. 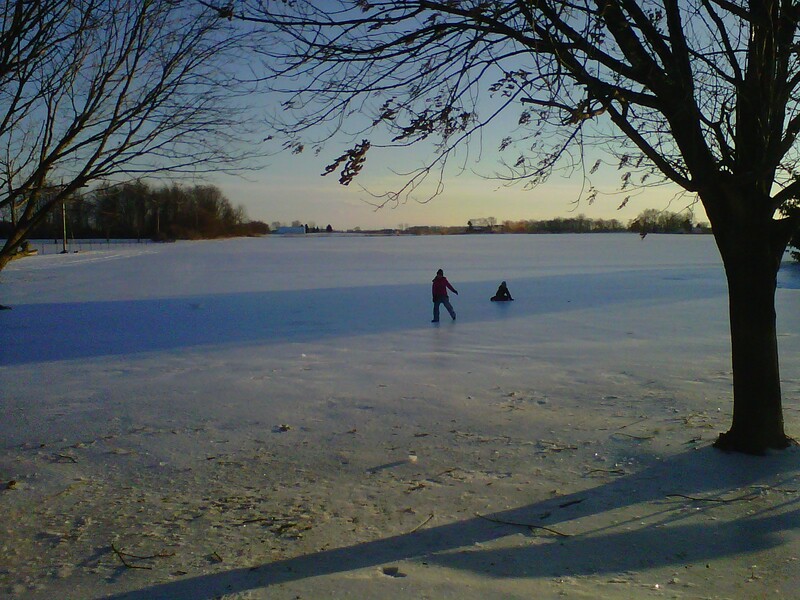 So while The Farmer worked hard to make sure our pigs kept warm, fed, and watered, I tried to occupy the kids for 4 days straight with playing outside not being an option. Big Sissy and I made The Farmer's favorite lasagna (watch for the recipe in a future blog) and her favorite puppy chow. I finally conceded and let Big Sissy and Bubby try out their ice skating skills, but don't worry... we aren't headed to the Olympics anytime soon. And truthfully, no matter the circumstances, how can you not smile back at this face? 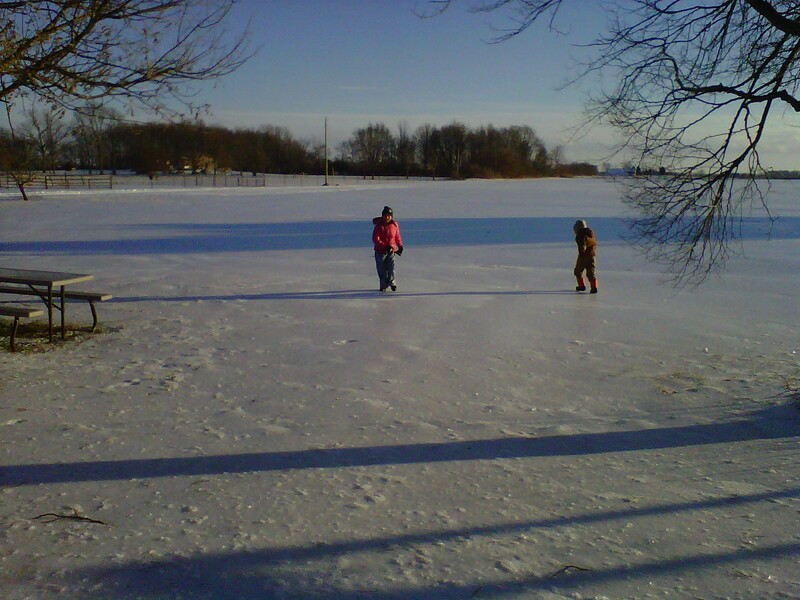 So I just hope you know the next time you are snowed-in, iced-in, or in general stuck with your family, besides trying to keep everyone happy, our family is also working round the clock to ensure our pigs are OK as there are no snow days on this family farm.